This book is a good exercise of “pulling myself up to understanding,” as Mortimer Adler has defined reading, since much of what Scruton says is difficult to understand. I took fifteen minutes to finish some pages. It felt like mental chin ups. Scruton defines culture as the accumulation of a civilization’s elements that have stood the test of time, though these reach different heights. Civilization, therefore, must constantly choose what it thinks is best, including customs and traditions. If we agree with him here, then we are set up for the politically incorrect conclusion that has been hiding around the corner: all cultures are not equally good. If a society consistently chooses, for example, that the best way to appease the gods is by sacrificing children to Molech, then that culture is inferior (at least in that particular matter) to other cultures that, say, preserve their children at all costs. And if that same society continues to add checkmarks in the “evil” column, then we should not feel bad at all about saying that culture A is superior to culture B. No one is arguing that inferior cultures have only checkmarks in the wickedness column and that superior cultures only have checkmarks in the virtuous column, just that the when everything is added up, we shouldn’t expect a tie. 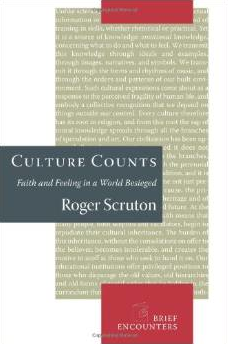 Scruton gives the reader seven chapters of tools to judge the virtues of culture. The chapter that struck me most was the fourth: “The Uses of Criticism.” Scruton jumps right into an insightful philosophical analysis of humor. “Comedy is a fundamental ingredient in every serious culture” (45). Humor has value because it unites people and philosophies, for aren’t our closest friends the ones with whom we can laugh about the same things? To agree in our laughter is to agree in our judgments. My colleague Seth and I laugh about the kiosks in our villages, the materialism of America, the administration of the Zimbabwean government, and the missionaries from Wheaton that double as Abercrombie models because in laughing together we are concluding together. I doubt you have ever heard a Muslim laugh at his own civilization? Scruton says this is dangerous because the one who cannot laugh at himself lacks “the principal way in which people come to terms with their own imperfection” (48). Short book, long read, but worth it.